He is a great listener! Always works with you to help you feel your best and live a normal lifestyle. Bestdoctor I’ve ever had. Many options for back issues not just medications . He’s a cutting edge doctor. And his nursing staff is incredible, they all work as a wonderful team . He is a great listener! Always works with you to help you feel your best and live a normal lifestyle. Best doctor I’ve ever had. Many options for back issues notjust medications . He’s a cutting edge doctor. And his nursing staff is incredible, they all work as a wonderful team . Extremely knowledgable and helpful -- provided novel options for treating pain that have not been presented by other doctors.Would highly recommend. Extremely knowledgable and helpful -- provided novel options for treating pain that have not been presented by other doctors. Would highly recommend. Dr. Hasan Badday is board certified, fellowship trained Interventional pain management specialist and stem cell surgeon. 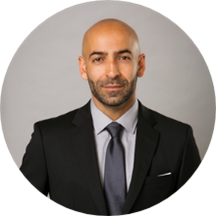 He earned his American Board of Physical Medicine and Rehabilitation after completing a PMR residency program in Georgetown and is a Diplomat of the American Board of Pain Medicine. Dr. Badday offers a wide variety of treatments for pain relief from his comfortable and modern offices located in Irvine and Los Angeles, CA. He is dedicated to helping his patients to manage and relieve their pain to live full and active lives. He helps his patients with proven pain management treatment options such as, facet joint injections and epidural injections as well as helping them to manage their medications and offering innovative treatments including Stem Cell therapies for joint and muscular pain and Botox® treatments for chronic headaches. Dr. Badday is dedicated to the diagnosis, treatment and care of his pain patients with a wide variety of spinal and musculoskeletal conditions. Having performed thousands of spinal pain injections Dr. Badday is recognized for his exceptional skills and patient care. Dr. Badday is currently welcoming new patients to his practice and accepts most major forms of medical insurance.Dr. Badday is certified by the American Board of Physical Medicine and Rehabilitation. He also holds hospital privileges at the Virginia Hospital Center in Arlington, VA. Dr. Badday’s catalog of medical procedures is impressive and includes services such as interventional fluoroscopic pain management, facet joint injections, spinal cord stimulator trials and permanent implants, and lumbar discography. He also focuses on new innovative procedures for regenerative medicine, such as, PRP and stem cell treatment. Dr. Badday is very attentive and makes you feel like he cares! Dr. Badday is always friendly and makes me feel as if he cares! Dr. Badday is great and always listens to me in order to best help me with what I need. Dr. Badday is very thorough and helpful. Never ever prefer to go again. Dr was very pleasant and through. Too time to explain my condition and the plan moving forward. When I left the doctors office, I felt informed, well treated and prepared to begin the comprehensive treatment plan. Dr. Badday is awesome and he's got a great sense of compassion for clients. I felt comfortable asking questions, and he gavereally great explanations about what's causing the chronic pain I've been experiencing. By far the Best Doctor and Pain management Doctor in California. The staff are also amazing. I have nothing but good things to say! Dr. Badday is incredible! He is so invested in making sure he gets to the root of your pain issue. His bedside manner is impeccable. He really makes you feel comfortable and cared about! Highly recommended! Very friendly, was a great Doctor! Dr. Badday is an amazing doctor, he is professional while treating you as a person not just a patient. I see him on a monthly basis and I enjoy my appointments, I actually look forward to them. He is friendly, caring,and listens to all concern and provides answers to any questions. His staff are polite as well as friendly and they will go the extra mile to accommodate you within reason and answer all concerns or questions. By far my favorite doctor. I would recommend him to family and friends. If you feel you have hit a road block with your pain management, I highly suggest making an appt with him. He has helped me so much and I am very grateful for all the help and care him and his staff have provided me. A very good doctor! Recommend. He is well aware of all the pain problem. Different methods of treatment. Thank you! A very good doctor! He is well aware of all the pain problem. Different methods of treatment. Thank you so much Dr Bad day! You very Professional Doc! I felt this pain specIalist addressed all my medical concerns and seemed willing to help me with my pain issues. I had terrible knee pain for several weeks. This pain management specialist took real interest in my case and provided me immediate treatment. Very pleasant and honest. Was thoughtful and engaged in my visit. Hi! My name Nick. I'm 42 years old. Dr Hasan Badday - the best doctor, whom I met for the last 2.5 years! I have chronic back pain, and severe chronic pain in the legs. I did 15 surgery on mylegs. A week ago, Dr Badday make me an injection in the neck spine - epidural . After that - I began to live! This injection has helped me. Pain decreased. The swelling on his right arm has decreased! I can work ! I work for a moving company. Thank Dr Badday! You're the best doctor! I recommend to make appointment for him at the reception and begin treatment. Thank you so much Dr Badday!!! Nick. Didn't take the insurance that supposedly was accepted . other than that was nice demeanor and understanding . Have to reschedule if i plan to be trreated by him in the future as a cash patient until he is set up for medicare. Dr. Badday is an excellent dr. He listens to you and treats you accordingly. Excellent doctor, treats you as a person and shows care and concern in regards to quality of daily life. Would recommend him to family, friends and anyone in need of pain management. I will never forget the trouble I had findinga doc who wld listen and take note of what I was feeling, I cried on my first appt when he told me he would help me. Without Dr. Badday I would not have any quality of life, because I was in so much pain I couldn't get out of bed. I am very geatful to have him as my doctor. He listens and finds the right course of treatment tailored to you, if things change he continues to work with you based on what best fits your needs to find the best treatment plan. I had my first consultation with Dr.Badday earlier today. He took the time to explain and even diagram the pain in terms that I could comprehend and provided a well rounded treatment plan. Not many Physicians will take the time todo that. He addressed both the physical pain as well as emotional that comes with having chronic pain. Professional, courteous and an undeniable expert in pain medicine, built a rapport and trust with ease. Highly recommend. Dr. Badday really took his time with me. It was a little hectic because he is brand new to Orange County and doesn't have his own practice office. Though it was a little disorganized he more than made up for itwith a very thorough exam and treated me with respect. He never made me feel stupid and accepted quickly that I was knowledgeable about my injuries and the anatomy of the spine so he spoke to me like an equal. Dr Badday is genuinely concerned with my well being overall and takes the time to explain the alternatives and the treatment. I would highly recommend him. Very capable, kind and trustworthy! Dr. BADDAY IS A CONSUMMATE PRIFESSIONAL. CLEAR, CONCISE, KNOWLEDGEABLE, AND DISSEMINATES COMPLEX INFORMATION INTELLIGIBLY. Best doctor I have ever seen. If your looking for a doctor who actually cares about his patients and will do anything to help make your life better then he's the doctor for you. Dr. Badday is one of the best doctors I have seen. He is one of the few dr.s that really cares and listens to you. He doesn't rush you in and out, he seems to understand how pain effects everyone different.Dr. Badday took his time didn't try to push any treatments on me like most dr.s do, the dr. and I talked about what helped in the past and what he thought may be beneficial to me now and treated me appropriately. I would recommend all the pain patience to make an appointment and go see dr. Badday. Professional, pleasant, straight to the point and compassionate! Very attentive knowledgeable but not very open-minded to all types of treatment, I assume due to the climate of severe abuse of prescription medications. Would recommend Dr Hasan Badday to Anybody who is looking for a great caring Doctor . Dr. Badday is amazing! He understands exactly what is going on with my diagnosis and has a plan to practively solve the situation. He listens and explains everything thoroughly!! His staff is also kind and professional! Always a great experience! I was pleasantly surprised with the experience of finding a Physician through ZocDoc. The location, friendly staff and Dr. was a perfect match for my needs. Recently relocated to a new area, and not knowing anyone, I found this tool to be very useful! It went well. This was my first visit and I feel like there is hope again. Dr. Hassan really helped me understand my injuries. He is very insightful and helpful. He made me feel comfortable and at ease during my consultation. I would diffentatly recommend him to anyone suffering from pain. My appointment with Dr. Hasan Badday was great . Explains everything to you , And most important listens to what you have to say. Even the receptionist was very nice and very helpful . I would definitely would see Dr. Badday do to his thorough examination and his attention to detail. He is also very personable.